The Barking Basics!® Dog Leash in Black is a durable and classic design that is perfect for any outing. This Barking Basics!® Dog Leash in Black is a staple for any dog's walking wardrobe. 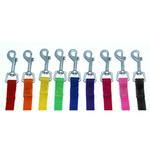 Each dog leash features a nickel-plated swivel clip for a quick and secure attachment. Matching collar sold separately. This black-colored leash is great because it goes with almost everything and doesn't show the grime. It's also a popular choice for Halloween. Our black leash and other Barking Basics products will also move your pup to the head of the team by sporting team colors! For instance, the Oakland Raiders, the Carolina Panthers, the Baltimore Ravens, and the Pittsburgh Steelers will always find this leash to be the team pick. As far as baseball fans go, the Baltimore Orioles, the Florida Marlins, the San Francisco Giants, the Colorado Rockies, the San Antonio Spurs, and the Chicago White Sox, all have black colors prominent in their team wear. Don't leave out the hockey fans! The New Jersey Devils, Tampa Bay Lightning, Carolina Hurricanes, Anaheim Ducks, Pittsburgh Penguins, Chicago Blackhawks and Los Angeles Kings all love their black gear and so will your dog! Barking Basics Dog Leash - Black Customer Photos - Send us your photo! Love my new harness doesn't pull my neck and I feel more free during my walks with mommy. Plus since it's black it can go with anything. Woof Woof Thanks BaxterBoo A big wet kiss from me. 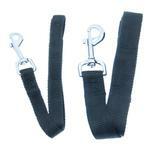 Great quality Leash, great price!!! Posted On 09/10/17 by Kathy H from Janesville, WI Yes, Kathy H recommends this product! As always...great product, great price and speedy delivery!! Just adding to our sweet girls leash collection...have to be color coordinated, don't cha know!!! Thank you Baxterboo !!! Good black leash for a really good price. Posted On 03/08/17 by Tammy O from Crown point, IN Yes, Tammy O recommends this product! Good quality but not as wide as I would of thought for length of leash. Posted On 01/18/17 by Jacqueline L from , NY Yes, Jacqueline L recommends this product! Great quality for my pit bull! Great price! Posted On 01/07/17 by Penny S from Waterloo, IA Yes, Penny S recommends this product! 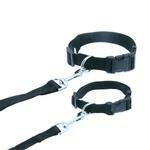 Great leash and its well made. Posted On 11/16/16 by Denise from , NY Yes, Denise recommends this product! A must in every dog's wardrobe. Unisex leash made very well. Fantastic price!!! Posted On 09/08/16 by Carmella S from Monroe Township, NJ Yes, Carmella S recommends this product! I wish it was a little wider but it isn't bad. This leash is good, but it was not quite what I expected. I thought it was going to be longer and thinner. It was too short and really bulky to the point where it was hard to walk my pup. Posted On 05/25/16 by Dorothy S from Howard Beach, NY Yes, Dorothy S recommends this product! The black goes great with the pink and black harness that I ordered from Baxter Boo.It came in three days. Appeared to be good quality. I Wanted a 6' leash but had to return it because the buckle is huge. My dog is only 15lbs and I could not fit the buckle onto his harness. Posted On 03/29/16 by Lora A from Lexington, KY Yes, Lora A recommends this product! Posted On 02/14/16 by Leah P from Green Bay , WI Yes, Leah P recommends this product! Bought this with the total control harness, luv them both! Price was right on, will buy all Meeko and Ella's fun stuff from here. Thank you! Posted On 01/24/16 by Nancy T from DAYTON, OH Yes, Nancy T recommends this product! This is a nice leash but a little more light weight than the Zack and Zoey products. Posted On 01/08/16 by Terri P from , Yes, Terri P recommends this product! These leashes are great! I have them in several colors and wish I had them in every color available. The 4 foot length is perfect for my little dog. This leash works great with the harness I purchased with it. It does not choke my dog, and it gives just enough length for him to wander without going too far. Posted On 12/04/15 by JP from Danbury, CT Yes, JP recommends this product! Another consistent product offering by Baxter Boo! 5/8" inch x 4 feet is just right. Well made and confident it will hold up to any squirrel or deer my little Lucy comes across! Posted On 11/04/15 by Donna F from MADISON, NJ Yes, Donna F recommends this product! I can usually find items not always available at my local pet stores.